Jurnal Pendidikan Fisika dan Keilmuan (JPFK) published by UNIVERSITAS PGRI MADIUN Program Studi Pendidikan Fisika. The research article submitted to this online journal will be peer-reviewed. Every article that goes to the editorial staff will be selected through Initial Review processes by Editorial Board. Then, the articles will be sent to the Mitra Bebestari/ peer reviewer and will go to the next selection by Blind Preview Process. After that, the articles will be returned to the authors to revise. These processes take two months for maximum time. In each manuscript, Mitra Bebestari/ peer reviewer will be rated from the substantial and technical aspects. Mitra Bebestari/ peer reviewer that collaboration with JPFK is the experts in the public administration area and issues around it. They were experienced in the prestigious journal management and publication that was spread around the nation and abroad. For year 2015, JPFK will publish in two times issues Volume 1, Number 1-2 are scheduled for publication: March and September. Please submit your article. 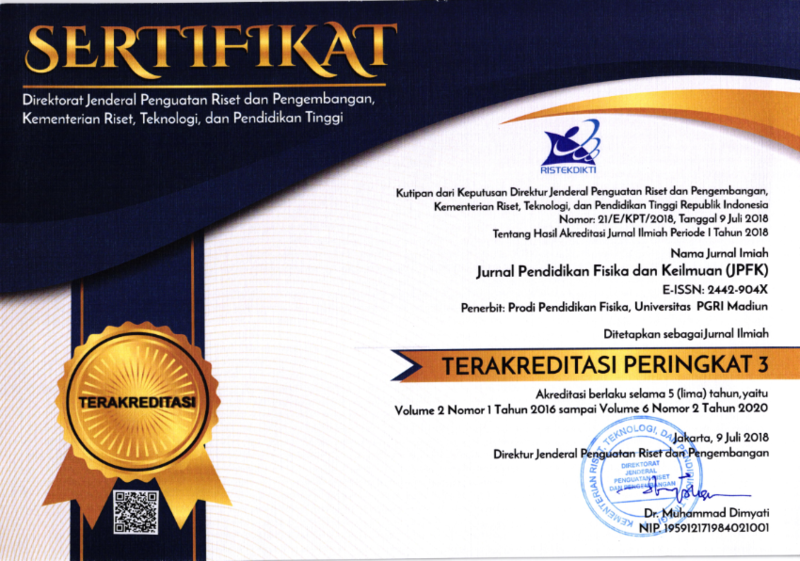 Jurnal Pendidikan Fisika dan Keilmuan (JPFK) is electronically published via journal website. Editorial Team checking manuscript using Grammarly®, and Turnitin.